Christian theologian; born in Alexandria about 185; died in Tyre about 254. Trained in the study of the Bible by his father, and in philosophy by the Neoplatonist Ammonius Saccas, he early devoted himself to the philosophical study of religion, and became an influential Church teacher and the founder of a school. His broad treatment of Christian doctrine exposed him to the charge of heresy; and his writings gave rise to prolonged controversies. Of his numerous works a few only have survived. Of these the most important are: the commentaries on the Gospels of Matthew and John; the great theological treatise "De Principiis" (Περὶ Ἀρχῶν); and the "Contra Celsum," a reply to the attack of the philosopher Celsus on Christianity (see Celsus). Origen's allegorical and spiritualizing interpretation of Scripture and conception of the Logos are similar to those of Philo; but his precise relation to the latter can hardly be definitely determined. It is uncertain whether he drew directly from Philo's writings or derived his hermeneutical method and his Logos doctrine through his teacher from the Alexandrian grammarians and philosophers. It is probable, however, that he, like his older contemporary Clement, was influenced by the Philonic doctrine. His works abound in explanations of Old Testament and New Testament passages. Though he had public disputations with Jews, his personal relations with them appear to have been friendly. In a number of places he speaks of consulting learned Jews on the meaning of Old Testament words and passages (see, for example, "De Principiis," i. 3, § 4). In the "Contra Celsum" he throughout defends the Jewish faith against the philosopher's attacks. Origen was, so far as is known, the first Christian scholar to undertake the study of Hebrew. It is not likely that he had a thorough knowledge of the language; though he in many places cites and explains Hebrew words, his Old Testament quotations are from the Septuagint, which he seems to have regarded as not less authoritative than the Hebrew text. There is no indication that he was acquainted with the Midrash. His chief contribution to Biblical science was his attempt to establish the true text of the Septuagint, his object being to define the exegetical relations between Jews and Christians. To this great work—the foundation of the science of Biblical text-criticism—he devoted twenty-eight years, collecting materials from all parts of the Christian world. 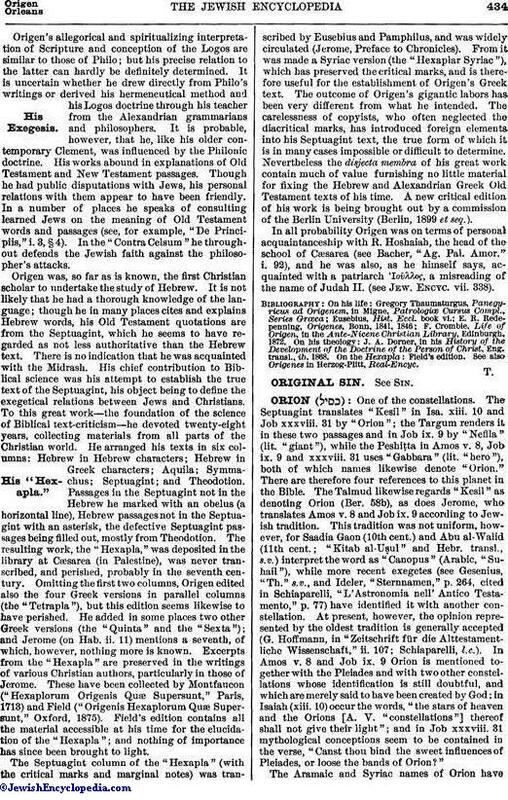 He arranged his texts in six columns: Hebrew in Hebrew characters; Hebrew in Greek characters; Aquila; Symmachus; Septuagint; and Theodotion. Passages in the Septuagint not in the Hebrew he marked with an obelus (a horizontal line), Hebrew passages not in the Septuagint with an asterisk, the defective Septuagint passages being filled out, mostly from Theodotion. The resulting work, the "Hexapla," was deposited in the library at Cæsarea (in Palestine), was never transcribed, and perished, probably in the seventh century. Omitting the first two columns, Origen edited also the four Greek versions in parallel columns (the "Tetrapla"), but this edition seems likewise to have perished. He added in some places two other Greek versions (the "Quinta" and the "Sexta"); and Jerome (on Hab. ii. 11) mentions a seventh, of which, however, nothing more is known. Excerpts from the "Hexapla" are preserved in the writings of various Christian authors, particularly in those of Jerome. These have been collected by Montfaucon ("Hexaplorum Origenis Quæ Supersunt," Paris, 1713) and Field ("Origenis Hexaplorum Quæ Supersunt," Oxford, 1875). Field's edition contains all the material accessible at his time for the elucidation of the "Hexapla"; and nothing of importance has since been brought to light. The Septuagint column of the "Hexapla" (with the critical marks and marginal notes) was transcribed by Eusebius and Pamphilus, and was widely circulated (Jerome, Preface to Chronicles). From it was made a Syriac version (the "Hexaplar Syriac"), which has preserved the critical marks, and is therefore useful for the establishment of Origen's Greek text. The outcome of Origen's gigantic labors has been very different from what he intended. The carelessness of copyists, who often neglected the diacritical marks, has introduced foreign elements into his Septuagint text, the true form of which it is in many cases impossible or difficult to determine. Nevertheless the disjecta membra of his great work contain much of value furnishing no little material for fixing the Hebrew and Alexandrian Greek Old Testament texts of his time. A new critical edition of his work is being brought out by a commission of the Berlin University (Berlin, 1899 et seq.). In all probability Origen was on terms of personal acquaintanceship with R. Hoshaiah, the head of the school of Cæsarea (see Bacher, "Ag. Pal. Amor." i. 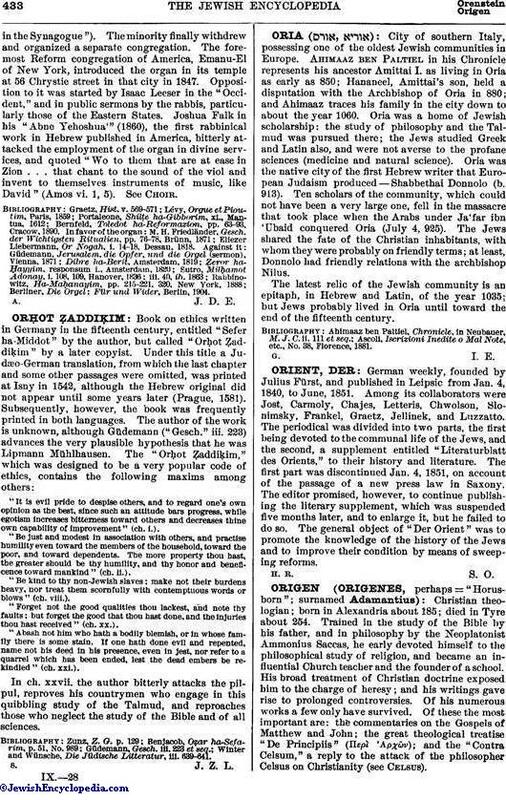 92), and he was also, as he himself says, acquainted with a patriarch Ἰοῦλλος, a misreading of the name of Judah II. (see Jew. Encyc. vii. 338). F. Crombie, Life of Origen, in the Ante-Nicene Christian Library, Edinburgh, 1872. On his theology: J. A. Dorner, in his History of the Development of the Doctrine of the Person of Christ, Eng. transl., ib. 1868. On the Hexapla: Field's edition. See also Origenes in Herzog-Plitt, Real-Encyc.